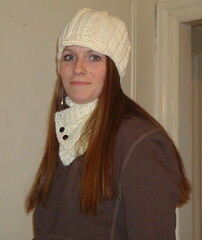 I've been looking for a crocheted winter hat for a while & I couldn't find any I like so I searched etsy for one. I came across one from CrochetDad I liked a lot but it was a bit too small for my big head. I convo'd him to ask if he could make me a custom order & I gave him my measurements. I also asked him to make me a matching neck warmer. A few days later my custom order arrived! I love it! Check out his shop!